Snow Badua Tweeted that the Talk 'n Text Tropang Texters crashed the Powerade Tigers in their tune-up game last night, 103 to 79. That's a whopping 24 point lead. That's quite a scary lead because Powerade is such a good team. In fact Powerade beat Ginebra in one their tune-up games, 92-73. You can really say that the Talk 'n Text Tropang Texters are really determined to get their first ever Grand Slam Title. They seemed to get stronger as time goes by. Jimmy Alapag said that they practice twice a day everyday. One in the morning and one in the afternoon. That is probably the reason why they are getting stronger than ever. 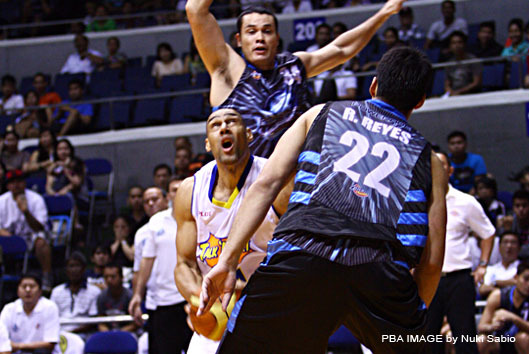 They are in it to win it in the 2011 PBA Governor's Cup. Hindi makaka - grandslam ang Talk n' Text!